MID JUNE - LATE AUGUST THIS PROPERTY WILL RENT BY THE 'WEEK' ONLY, FROM 9AM SATURDAY TO Noon FRIDAY (7 days/6 nights). Friday night the property will also be available for check-in by 7PM for an additional $250 fee (you must let us know at least one week prior to your stay if you wish to book Fri night). September - Mid June - property has a check-in time of 3 PM and check-out time of 10 AM. 3 night minimum stay. 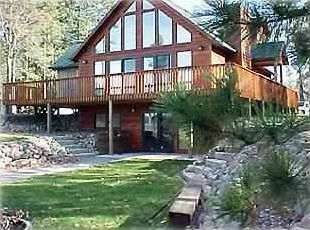 Spectacular, Non-Smoking, Cedar 'Chalet' on very private 202 Acre Big Bass Lake. Sleeps 12 Max. Five miles west of Minong, Wisconsin; 20 miles west of Hayward, Wisconsin. Great private sandy beach with very gradual depth - perfect for kids of all ages (don't be fooled by other properties that are vague when describing their 'beach'). Notice the very low listing number of our property - which means we've been renting this home exclusively as a vacation rental longer than almost anyone in the area (and it is properly licensed with the state and county for rental purposes, it is properly insured as a rental, etc. - many properties are not since they are often owner occupied much of the year). Plus, we have a Property Manager/Handyman NEARBY. If you have ANY issues that arise during your stay our local Property Manager is here to help address your issue PROMPTLY. For more pictures and information on this property including testimonials from dozens of satisfied renters, please go online to haywardvacationrentalsdotcom. We want you to be assured that you are booking a quality property that is everything it is advertised to be. New Golf Course, Public Beach (w/boat landing) nearby and miles of ATV & Snowmobile trails surrounding. Great lake, with crystal clear water, for waterskiing/jet skiing. One seasonal neighbor to the east, but NO neighbors to the west (over 1000 feet of vacant lakeshore). Beautifully landscaped yard with three rock retaining walls, new sod, brick walkways, and a huge stainless steel firepit overlooking the lake. Take the steps straight down to the lake and new dock. Canoe, oversize swim raft and paddleboat included. Interior is immaculate and very tastefully decorated. Pine ceilings and hardwood floors in great room, fireplace, attached gazebo with lake view and nice patio/lawn furniture set. Ceramic tile in all three full bathrooms (one on each level and one with new 6' jacuzzi tub). This place has it all, too much to mention. You will be hard pressed to find a finer vacation home in the area. Bedroom Layout: King (firm) in upper master suite, king and queen on main level, king (softer) and queen (firm) in walk-out basement, as well as a new bunk bed with a full size mattress on bottom and twin on top in the basement. Basement is completely finished except for the floor that we have chosen to keep as cement for now (as that floor is very snow, sand and pet friendly down there as you enter the home from the lake). Pet Policy: All dogs approved by owner in advance. Cats not permitted. A pet policy agreement must be signed and a $250 deposit must be received. Dogs are only allowed in the basement which walks out to the lake (our lab loved it down there), due to pet allergies in our family (and for other renters with pet allergies). Dogs must be kept off of all furniture/bedding, pet waste disposed of properly and dogs are not allowed to go #1 or #2 in the very nice yard/lawn area between the home and water (ruins grass). Dogs are NOT allowed on upper two levels and you are expected to vacuum up the majority of pet hair prior to departure or a separate cleaning fee will apply. Other basic pet rules apply such as no barking allowed, no pet trespassing at neighbors, pick up pet waste, the normal 'common sense' rules that go hand-in-hand with being a respectful pet owner at a rental property. Our future owners of this property... With such an ideal, secluded location this vacation property is a diamond in the rough, for year-round fun, fishing, swimming, boating, snowmobiling and much more. Book today! Very secluded, quiet location on a dead end road in the heart of the northwoods...and perfect sunsets you'll never forget right from the deck/dock! Sandy, No Weeds and Very Gradual Depth - Great for swimming, water-skiing, jet-skiing, fishing - all right from the on-site dock/pier. (2) Extra Fridge/Freezer in the Basement for larger groups. Wonderful house. Super responsive owners. Peaceful location. We were a big group and the house had plenty of room. Highly recommended! We had such a wonderful time here. The house is gorgeous and had everything you could possibly need. The lake was gorgeous and very swimmable. And there was so much to do in the area we were never bored. I highly recommend. Our family of 12 rented this house for a week! Jason and Kathy were super helpful in answering questions before we arrived so we could have everything we needed without over packing. They were available during our stay for questions as well which was helpful a couple times. Quick responses and always very pleasant. We even had the pleasure of meeting Jason on our last day there and he was very pleasant and nice to talk to. The cabin itself worked out perfectly for our family. There were plenty of beds for everyone, all of which were comfortable. Extra blankets were provided and very handy for cool nights. The pool table was a huge plus as were the big open living room and kitchen/dining areas so we could all be together without feeling crowded. We made the quick drive into Hayward a few times to go shopping, go-karting etc. The lake is so clear you can easily see down 10 feet if not more. We caught some beautiful pan fish as well as bass while we were there which made it fun for all! The lake is perfect for kayaking or tubing and other water sports depending what you like. This was the perfect spot for our vacation and I'd highly recommend it! What a wonderful location for a 3-generation family vacation! Jason and Kathy's spotlessly clean home is lovely, is 100% furnished inside with anything you could possibly need, and the assortment of boats at the dock accommodated every possible activity level. The lake is beautiful, not crowded, clean, and we enjoyed fishing, boating, and floating. We grilled, used the fire pit, the toddlers played in the yards and watched the chipmunks, and we gazed at beautiful sunsets from the deck. We especially appreciated having three full bathrooms, a dishwasher, and the use of their washer and dryer. Everything was exactly as pictured and as described. Kathy and Jason recommended Black Bear Golf, about 12 miles away, and we took full advantage of that little gem. We also frequented Minong's bakery and huge grocery store, and also Flapjack's for breakfast. What a friendly little town! We fully recommend this vacation getaway - thanks to Kathy and Jason! I rented the Cedar Chalet on Big Bass Lake for three nights at the beginning of deer hunting season. My brother-in-law and two son-in-laws had a great stay. No hunting for us, but we always enjoy the energy of this weekend. The home was exactly what we were looking for. It was remote, but modern, and still close enough to Minong. We each got our own bedroom with a comfortable, large bed. Three full bathrooms were more than enough. The kitchen was large and open. We had a few drinks and played dice while the fireplace roared. Kathy and Jason made us feel welcome and were easy to communicate with. Jason was in the local area, so he opened the home before our arrival and got the heat and water running. He also brought us plenty of firewood. I would definitely recommend this property for a future stay. I just recently returned from a 3 night guys weekend with 4 other buddies at this house and we are already talking about going back next year. The owners are awesome folks to work with. Any question was answered quickly and often with a sense of humor. Hopefully I can share a bit of whiskey with them in the future! The house itself was perfect for our needs, with beds for everyone, a game room, big screen TV, a great deck which we were able to take advantage of with the unseasonably warm weather. Nothing like playing bags outside in February. One thing to be aware of is that the internet is on the slow side. It did not impact anything, but it was difficult for more than one person at a time to check emails. If you have teenagers who would not know what to do if they were not connected, this could cause some issues in paradise. FROM MID JUNE TO LATE AUGUST THIS PROPERTY ONLY RENTS BY THE 'WEEK' WHICH RUNS FROM 9AM SAT CHECKIN TO NOON FRIDAY CHECKOUT - NO EXCEPTIONS SORRY - DUE TO CLEANING STAFF SCHEDULE. FROM SEPTEMBER TO MID-JUNE CHECK-IN WILL BE AT 3 PM AND CHECK-OUT AT 10 AM. 3 NIGHT MINIMUM STAY. SEE BELOW OR OUR RENTAL AGREEMENT FOR CANCELLATION POLICY (WE DO INDEED PERMIT CANCELLATIONS - BUT VRBO ONLY GIVES US A FEW PREWRITTEN OPTIONS TO CHOOSE FROM ON THEIR MENU - NONE OF WHICH APPLY TO OUR PROPERTY - THEY DO NOT GIVE US THE OPTION TO STATE OUR POLICY IN DETAIL IN THE CANCELLATION SECTION EITHER, UNFORTUNATELY). CANCELLATION POLICY: FULL REFUND IF 60+ DAY NOTICE PROVIDED, MINUS $100 REBOOKING FEE DEDUCTED FROM DEPOSIT. IF LESS THAN 60 DAY NOTICE PROVIDED THEN DEPOSIT IS FORFEITED AND YOU ARE STILL RESPONSIBLE FOR 80% OF THE RENTAL AMOUNT IF THE PROPERTY CANNOT BE RENTED TO ANOTHER PARTY (in 10+ years we have always been able to re-rent the home as long as plenty of notice is given - especially in the Summer months). Additional Charge applies for parties of 5 or more - inquire for details - additional charge varies based on time of year.